Whatever culinary delight you are planning, be it pesto or a simple tomato and basil sandwich, the burst of aroma that emanates from fresh basil has an almost magical ability to make you feel happy for no apparent reason. A pot of basil growing in the kitchen window will not only provide zest to winter dishes, it will inspire dreams of spring during the cold, dreary days of winter. Preparation Methods & Dosage :The uses of basil are limited only by your imagination. The fresh picked leaves make a stimulating and refreshing tea, and in the summer use them on sandwiches just as you would a leaf of lettuce. Crush the leaves and rub a bit on your skin to make a handy remedy for insect bites when you are out tending to the summer garden. To remove a wart, rub basil leaves on the nub daily and cover with a bandage. In the Kitchen: Mediterranean and Indochinese cuisines frequently use basil, the former frequently combining it with tomato. One of the most well known uses of basil is as one of the main ingredients in pesto. 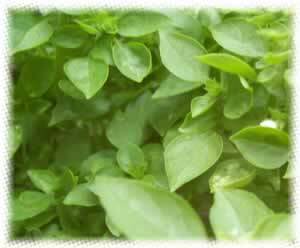 The sweet or bush basil is Ocimum basilicum is the one most used as a condiment. There are about a hundred and fifty varieties of basil, now found through out the world. There is an old saying that basil brings prosperity and happiness when planted in the garden. Basil is a very satisfying plant for gardeners because a small amount of seeds can reliably produce an abundance of beautiful plants. There is a wide variety of basils, with leaves that range from deep purples, and verdant greens, to tiny, light green bushy plants. In late summer, basil sends up pretty white, purple, or pink flower stalks that bear the tiny seeds. 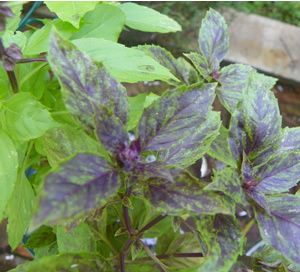 Basil is a carefree plant for the most part not having much trouble with insects and leaf diseases, just give your plants a good amount of sun, and plenty of water and you will be well rewarded. Harvest the topmost leaves, to encourage growth. Harvest the topmost third of the plant before the first frost. Basil is originally native to India and other tropical regions of Asia, having been cultivated there for more than 5,000 years, reached Europe in the sixteenth century. Basil brings prosperity and happiness when planted in the garden. In Europe, they place basil in the hands of the dead to ensure a safe journey. In India, they place it in the mouth of the dying to ensure they reach God. The ancient Egyptians and ancient Greeks believed that it would open the gates of heaven for a person passing on. Weiss, Gaea and Shandor. "Healing Herbs, The",(1985) Basil in considered a safe and gentle tonic for nursing mothers. Taken as a tea, it helps to expel gas in infants and increases lactation in the mother.